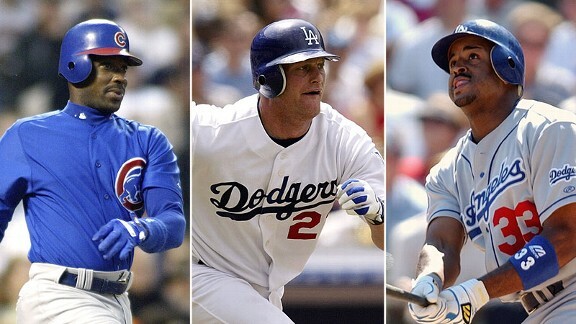 Getty Images Official Hall of Fame candidates Fred McGriff, Jeromy Burnitz and Brian Jordan were 2003 Dodger teammates, though the trio never appeared the same game together for Los Angeles. Jeff Bagwell, Jeromy Burnitz, Vinny Castilla, Juan Gonzalez, Brian Jordan, Barry Larkin, Javy Lopez, Edgar Martinez, Don Mattingly, Fred McGriff, Mark McGwire, Jack Morris, Bill Mueller, Terry Mulholland, Dale Murphy, Phil Nevin, Rafael Palmeiro, Brad Radke, Tim Raines, Tim Salmon, Ruben Sierra, Lee Smith, Alan Trammell, Larry Walker, Bernie Williams, Tony Womack, Eric Young. Best friend of Dodger Thoughts and ESPN reporter Molly Knight and her friend and fellow ESPN contributing writer Anna Katherine Clemmons have had the story of their cross-country road trip (which began as fodder for a magazine article) optioned for a movie. My Variety colleague Jeff Sneider has the details. 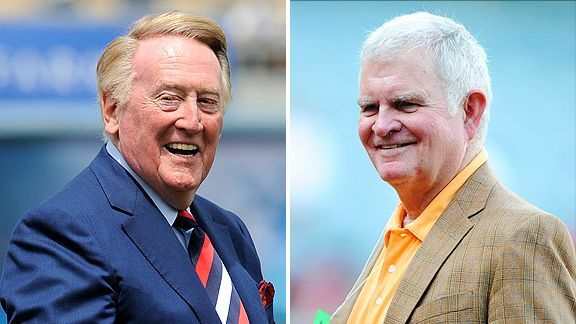 Larry King is reportedly joining the Dennis Gilbert-headed group bidding to by the Dodgers, reports Tony Jackson of ESPNLosAngeles.com. Hank Aaron inquired whether Medallion Financial Corp., on which he serves on the board of directors, might make a bid to by the Dodgers, according to Bill Shaikin of the Times. The answer: No. A bow-hunting trip (no, not the kind where you hunt Ken Rosenthal’s ties) with Royals outfielder Jeff Francoeur and manager Ned Yost helped lure Jonathan Broxton to Kansas City, writes Kevin Kernan of the New York Post (via Hardball Talk). Here are some childhood photos of Clayton Kershaw with longtime buddy Matthew Stafford, the Detroit Lions quarterback. And, here’s a great prep school picture of birthday boy Vin Scully via Tom Hoffarth of the Daily News. Some nifty portraits accompany this interview by Ernest Reyes of Blue Heaven with artist Tommervik. 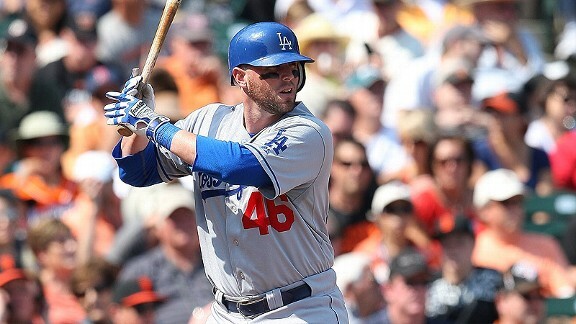 Evan Bladh looks back at the 2003 Dodgers at Opinion of Kingman’s Performance. Ken Arneson discusses the two systems of thought with regards to statistics, and how they relate to kids learning to read. Very, very cool skiing and outdoors footage in “Winter,” which will screen at the Village in Westwood on Sunday. Finally, if you haven’t seen “Beginners” with Ewan McGregor, Christopher Plummer, Melanie Laurent and Goran Visnjic, I really recommend it. No draft pick compensation for free agents unless they spent the entire season with your team. Compensation picks will be awarded if a team offered the departing free agent “a guaranteed one-year contract with a salary equal to the average salary of the 125-highest paid players from the prior season.” No more Type A and Type B free agents. Jayson Stark of ESPN.com has a worthwhile Q&A with union chief Michael Weiner. Buster Olney of ESPN.com says there are real questions of how the new deal will affect competitive balance. Chad Moriyama breaks down the changes in the new CBA — I cribbed from his piece to give you the bullet points up top. Matt Swartz of Fangraphs analyzes the impact of the draft compensation changes. Thirteen teams will be in a lottery to earn one of six extra draft picks in the 2013 draft, writes Jonathan Mayo of MLB.com (via MLB Trade Rumors). In 2002, he was a postseason hero for the Angels, but if he is to do the same in 2012, Adam Kennedy will do so as the guy who steps in for the Dodgers if and when Juan Uribe or Mark Ellis get hurt. Tony Jackson of ESPNLosAngeles.com reports that the Dodgers are close to signing Kennedy, who will be 36 in January, to a contract that presumably would bind both parties to each other for some period of time. Kennedy would take the place of Aaron Miles from the 2011 team and probably pushes Russ Mitchell down the 2012 depth chart back into the minors, at least for now. 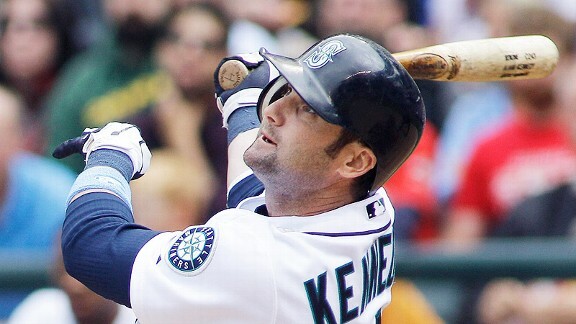 Kennedy struggled to a .277 on-base percentage and .355 slugging percentage in 409 plate appearances last season, though that was with his home games in the poor hitting environment of Seattle. His last solid season was in 2009 with Oakland, when he produced a .348 OBP and .410 slugging in 586 plate appearances. Assuming he makes the team, the left-handed hitting Kennedy would be the primary backup at second base and third base, with Justin Sellers competing with Mitchell and any other incoming detritus for the other backup infield spot. If Sellers didn’t make the team, then Uribe would probably become the Dodgers’ backup shortstop behind Dee Gordon. If Kennedy’s contract is the equivalent of the minor-league deal that led to Miles’ run as a Dodger, then that’s a no-risk deal that anyone can live with. But if it starts to move toward or beyond Dioner Navarro territory, one might start to wonder what the point is. The setup: The polarizing pitcher whose mostly dominant career was marred by two notorious postseason setbacks entered his free-agent year hoping to recover from his biggest struggles yet – having allowed 62 baserunners and 26 runs in 29 2/3 innings dating back to his infamous 48-pitch outing against the Yankees on June 27, 2010. … I really think it’s important to be clear about this. For the longest time, the concern that Broxton’s detractors had was not that he couldn’t get anyone out, but just that he wouldn’t get the job done in October. The explanation offered the most was that he didn’t have the backbone, guts or other relevant body part to succeed under pressure. … The problems of Jonathan Broxton today are different problems entirely. Two scoreless outings brought some temporary relief for the reliever, but on April 25, Broxton was charged with a blown save thanks to two unearned runs at Florida, an outing that led to questions about whether he was still the Dodger closer or not. He allowed three hits and a run while picking up a save April 29. Jonathan Broxton has given Dodger fans a lot of heartache this year, but tonight he looked as sickly as he ever has in my memory. Broxton entered tonight’s game in the ninth inning of a 1-1 tie. After retiring Aramis Ramirez on two fouls and a popout, Broxton walked the next two batters on eight pitches, and few of them were close to the strike zone. According to MLB Gameday, the pitches were all fastballs, one reaching 93 miles per hour and the average at 91. That’s just not the Broxton of 12 months ago, and I’m not convinced it’s even the Broxton of 12 weeks ago. People have been strangely fascinated with Broxton’s facial expressions and posture, but here’s a suggestion: Someone needs to look at his arm. Even if they’ve looked at it before, look at it again. After the first walk, Blake Hawksworth began warming up in the bullpen, and after the second, Don Mattingly came to the mound. He talked to Broxton and the other assembled Dodgers, clearly stalling for time as Hawksworth raced to get ready, before finally telling home-plate umpire CB Bucknor to call for a rare mid-inning hook of the Dodger reliever. On the next day, Broxton was shut down to have an MRI, and he never pitched again for the Dodgers in 2011. Even after he went to the disabled list, the diagnosis (or at least the seriousness) of his condition seemed to keep shifting, punctuated by a rehab process that ended up being scrapped at the end of June. Not until September, more than four months after his last major-league game and 15 months after the series against the Yankees that seemed the source for all his problems, was Broxton finally scheduled for surgery. His final numbers for 2011: 12 2/3 innings, eight earned runs, 24 baserunners, 10 strikeouts, 5.68 ERA, four inherited runners (all stranded). Coming attractions: Broxton’s Dodger career ended with the news today that he had signed with Kansas City, pending a physical. Reports are that he will earn a $4 million base salary plus incentives. Broxton leaves Los Angeles as its all-time leader in strikeouts per nine innings with 11.6 (minimum 300 innings), fifth in adjusted ERA at 132 and seventh in saves with 84. There is one thing I will insist on, however. 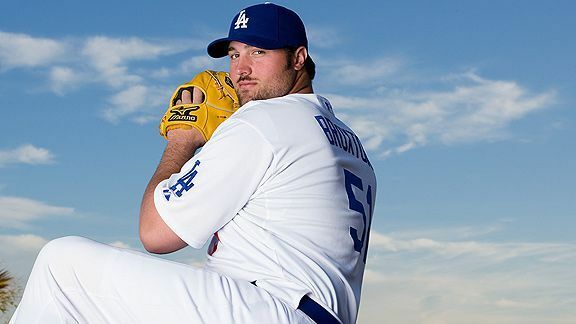 For nearly five seasons – an eternity for most relievers, longer than, for example, the elite tenures of Eric Gagne or Takashi Saito as Dodgers – Jonathan Broxton was a great, great relief pitcher. The NLCS losses were crushing – indeed, for many they were poisonous – but he’s hardly the first great hurler who has pitches he’d like to get back. He has truly been one of the best relief pitchers in Los Angeles Dodger history, whether his best days are over or not. Once more, it’s 2-for-1 day: Happy birthday to two of the best. The setup: Patience was wearing thin for the 2002 No. 1 draft pick after his offense declined for the fourth consecutive season at age 27. He actually took an .803 OPS into the 2010 All-Star break, but floundered to .616 thereafter. Adding to the disconcerting power drought was a walk/strikeout ratio that declined from 1.03 in 2009 to 0.55. The closeup: What a strange year. As early as April 9 came a short post with the headline, “The lowest moment of James Loney’s career?” after he was told to bunt with a runner on second base and none out in the 11th inning of a game against a right-handed pitcher. While we would come to learn that extraneous sacrificing was perhaps the biggest foible of Don Mattingly’s rookie season as manager, things actually sunk lower for Loney before they got better. With a .194 on-base percentage and .213 slugging on April 25, Loney caused us to begin ruminating about the future of the worst-hitting regular in major-league baseball. … The problem is not that Loney will hit this poorly forever – he won’t. The problem is that it seems less and less unlikely that, after three consecutive seasons of decline from 2008-10, he’ll take the step forward that the Dodgers have been counting on him to take. If Loney can’t offer better than the league-average hitting that has defined his past three years – and now he has even further to go to reach that goal – there’s little chance the Dodgers can continue using him as their starting first baseman, whatever you think of him as a defensive player or RBI man. They will part ways with him after the season, if not sooner. With a .534 OPS by mid-May, he was still on his way to one of the worst starts in post-1988 Dodger history, though by this time the rebound had begun, and the countdown to his being non-tendered was put on hold. In a reversal of 2010, Loney’s offense shot up in this year’s second half to a .914 OPS that, unadjusted for park effects, was 14th in the National League. A popular theory was that new hitting coach Dave Hansen helped; though the timing might have been mostly a coincidence, Loney’s mechanics had changed by the season’s latter months. The sum total of it all was another substandard season for a first baseman. Finishing 2011 with a .339 on-base percentage and .416 slugging percentage, Loney was 19th offensively among MLB first basemen with at least 502 plate appearances according to Fangraphs, though his defense bumped him up a few slots. Though he hit seven home runs in his final 40 starts, he ended 2011 with only 12, failing again to reach his career high of 15, set in 96 games in 2007. Coming attractions: With the Dodgers’ elimination from the Prince Fielder-Albert Pujols festivities etched in everything but stone, Loney is set to get at least one more shot at first base before becoming a free agent at the end of 2012. No one would dare guarantee greatness from him at this point; the safe bet, after four straight years with OPSes in the .700s, is more of the same. Nevertheless, I don’t find it outlandish to suggest that the form he displayed after his season-opening slump in 2011 could continue throughout 2012. In fact, his OPS from April 26 to the end of this past season was .828 – get him to the starting gate quicker in 2012, and he’ll have what for him will be a career year. That the Dodgers need even more than a career year from him is a larger issue. Tonight, the football regular season ended for my biggest rooting interest, non-Dodger division: Stanford. Like the last time I pulled thus hard for a legitimate national title contender, the 2009 Dodgers, it began as a superb experience that ultimately turned frustrating, with a dose of thanks-for-the-memories perspective required to make sure I didn’t lose the forest for the Trees. The first half of the season was incredible. Stanford would make mistakes here and there that would leave you briefly questioning its adequacy, and then you’d look up and the Cardinal would be up by 40. You’d remember that you don’t need to be perfect every play to be, essentially, perfect. Then some injuries came, and some weaknesses were exposed, and Stanford spent the past month looking beatable, losing one critical game out of 12 when it could afford to lose none. Andrew Luck, the pole position 2011 Heisman Trophy candidate when the race began, suffered from having mediocre wide receivers but also was good for at least one really headscratchingly disastrous throw a game. Brent Musberger, who called several Cardinal games this season, would quickly minimize the interceptions to resume raising the roof of praise on Luck to Derek Jeter- like levels that — taking nothing away from Luck’s present and future greatness — made me a little uncomfortable. Stanford won’t win the national title, and Luck might not win the Heisman. In the case of the former, it would have been fun and preferable to the BCS to see the Cardinal in a playoff, especially with some healed players, but the team would have been an underdog by the time it reached a semifinal (unlike a year ago, when Stanford was truly playing as well as any team in the nation at season’s end). I don’t feel cheated. As for Luck, he’s great and still a worthy contender, but if he doesn’t win the Heisman, I think I’d still feel worse that Toby Gerhart didn’t win two years ago. Neither statistically nor subjectively does Luck strike me as an automatic. Expectations are mean, and I’m better to be rid of them. Much more than the Dodgers, success has been rare for Stanford football in my lifetime (and at this level unprecedented), and the journey of this team from 1-11 five years ago, through the big victories over USC, to the nearly dominant team of today had been an exquisite joyride. But right now, the disappointment with Stanford’s close call this season still lingers, to the extent that it’s easier for me to think right now about those ’09 Dodgers and their season turned on an ill-fated Jonathan Broxton pitch than the ’11 Cardinal. And though I don’t think Stanford will return immediately to its losing ways, the Dodgers should smell a title before the Cardinal does again. Without a doubt, I feel good about having had near-miss teams to root for, but it’s no substitute for feeling great. By the end of April, five months and four days from now, Frank McCourt must complete the sale of the Dodgers and also pay ex-wife Jamie McCourt a $131 million settlement. This means, Dodger buyers, that you hold the cards. Yes, at the end of it all, McCourt will be the one to select one winning ownership group (or combination of groups). But he can only pick from what’s in front of him. I assume you know not to do this, but here’s a reminder: No one should present any offer that allows McCourt to retain any portion of Dodger operations, specifically the parking lots, much less future TV revenue. I can’t imagine any buyer doesn’t agree with this, but in case someone thinks it might provide an advantage in the bidding, put that shortsighted thought out of your mind. This is not the time for anything but a clean break. Here’s a picture of recovering Dodger Stadium beating victim Bryan Stow with his family at Thanksgiving. It’s an absolutely wonderful sight that, at least if you see the picture as I do, also doesn’t allow you to escape the harrowing road they have been sent down this long year. Given the reality, however, it’s thrilling. Thanksgiving seems to have come at the right time for Dodger fans, who have new things to be grateful for amid the ongoing reminder that you can’t have it all. A magnificent season by Clayton Kershaw brought home a major postseason award, a similar one by Matt Kemp did not. The two and their somewhat forgotten teammates provided memories we’ll still be talking about years from now, but of course not the ultimate memory of a World Series title. On the first day of the month came the announcement of the sale of the franchise — the slow-cooking turkey in the oven that will be our feast when it is served, though we can only anticipate this morning how smoothly the cooking will go and how it will ultimately taste. I had visions of a pretty major soul-bearing post today, but I have mixed feelings about it. We’ll just say that for a long time now, I’ve been trying to cook a better turkey and instead have kept burning it. Sunday night, I decided to take a break from such culinary efforts and instead focus on other, smaller things that I can more easily accomplish, such as working extended metaphors beyond their capacity for effectiveness. I’ve been afraid to look away from the big picture, afraid to take my eyes off the road. All that long-distance driving to nowhere made me bitter, really bitter. I still have real fears about what’s going to happen if I don’t get to where I think I need to be, but the fear hasn’t helped. I thought it was driving me toward my goals, but instead, in the words of the Boss, it was just driving me down. So I’m lowering the bar. It’s shortsighted, but that’s the point. I won’t lie to you — there’s a hope that if I do some little things right, big dreams will come true. But no promises. Right now, it will have to be enough to get some little things in the bank. Some might say the bar has been too low for the Dodgers for quite some time now, but I’d say their past 23 years mirrors what I’ve been feeling inwardly. The goals are there; the execution has been lacking and the angst at times overwhelming. I honestly don’t know when all will be right in the Dodger world, but I do know that I’ve never wanted to be pissed off that it isn’t. Happy Thanksgiving, everyone, and all my best, wherever you are. And just one more thing: The other day, as God as my witness, my 7-year-old asked me if turkeys can fly. I began my National League Most Valuable Player watch on Matt Kemp in August, and along with the NL Cy Young scope for Clayton Kershaw, it became the primary Dodger story over the season’s final two months. That means a ton of words were spilled on the subject, and I’m reluctant, at this point, to spill any more (though for some fresh Kemp content, check out this ESPN.com roundtable on Kemp’s future in which I took part). Looking back, these are the four primary pieces, a combination of comparing Kemp to his closest rivals (which in the end boiled down to Milwaukee’s Ryan Braun) as well as arguing emphatically that the voting rules do not call for the MVP to come from a pennant-winner. 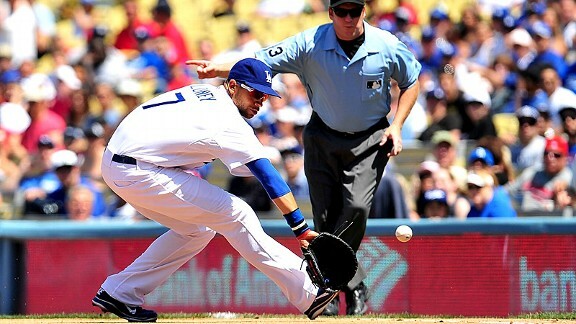 August 15: Matt Kemp really can win the MVP award, but will he? October 1: So when exactly were the Dodgers out of contention? The closeup: MacDougal not only ended up pitching more innings for the Dodgers than all but one of those names, he finished the year with the lowest ERA on the entire staff: 2.05. Now, if you were paying attention, you’ll know that latter figure is tainted: He allowed 17 of 51 inherited runners to score. It was actually much worse before the All-Star break, when he allowed 13 of 33 inherited runners to come home – nearly 40 percent. His second-half numbers (4 of 18) were respectable. He struck out 6.5 batters per nine innings but allowed 13.1 baserunners. So, he was effective, but then again he wasn’t, but considering his $500,000 salary, then again he was. MacDougal got his only save of the year in the Russ Mitchell game. After the Dodgers took a 6-3 lead in the top of the 10th inning against the White Sox, Matt Guerrier allowed two leadoff singles. Two outs later, MacDougal entered the game with the tying run at the plate, threw three pitches and retired Paul Konerko on a grounder to second. Coming attractions: Inherited runners or not, this was a rebound season for MacDougal, one that should modestly increase offseason interest in the free agent. From the Dodgers’ standpoint, it’s again a numbers game. Javy Guerra, Jansen, Guerrier, Hawksworth and Josh Lindblom are righties who should nail down spots on the roster, leaving at most one opening. But of course, things always get wacky in the bullpen. No doubt Ned Colletti would be interested in retaining MacDougal for depth, but price could be an object. The setup: With a .363 on-base percentage and .535 slugging percentage at Albuquerque in 2010, Mitchell was promoted in September to the Dodgers, for whom he put up this unusual line: 43 plate appearances, 37 outs (including a sacrifice fly), no walks, four singles, two home runs. In fact, his first two major-league hits were homers. The closeup: Mitchell started 2011 with the Isotopes but came to Los Angeles much more quickly, receiving an April 29 callup when Casey Blake went on the disabled list. Mitchell ended up with two separate one-month stints with the team, each except for walks mirroring what came before. In 58 plate appearances, he made 43 outs with seven walks, five singles, a double and two home runs. His career numbers now total a .208 on-base percentage and .290 slugging percentage with four home runs in 101 plate appearances. His most dramatic game by far came May 20: Against Sergio Santos, who had a 0.00 ERA in 20 2/3 innings for the White Sox, Mitchell (batting .067) hit a two-out, ninth-inning, game-tying homer that opened the door for the Dodgers to win in extra innings. When he wasn’t with the Dodgers, Mitchell had a .372 on-base percentage and .503 slugging percentage in 392 plate appearances with Albuquerque. In general, his on-base skills showed improvement in 2011. Mitchell’s season ended with wrist surgery on September 27, to address torn cartilage he had been playing with since May. Expected recovery time, according to Ken Gurnick of MLB.com, was up to eight weeks; currently we are at the 7 1/2-week mark. He signed up to play winter ball, with Tiburones de La Guaira in Venezuela, but he has not shown up in the stats yet as having appeared in a game. Coming attractions: Right now, the Dodgers have seven infielders on their roster and figure to keep six. Mitchell and Justin Sellers would probably be the backups if the season started today, but you can expect increased competition by the time March arrives. There has been talk that Mitchell, who will turn 27 in February, would work on catching to increase his value as an all-purpose backup, but his wrist problem has at a minimum slowed those plans. 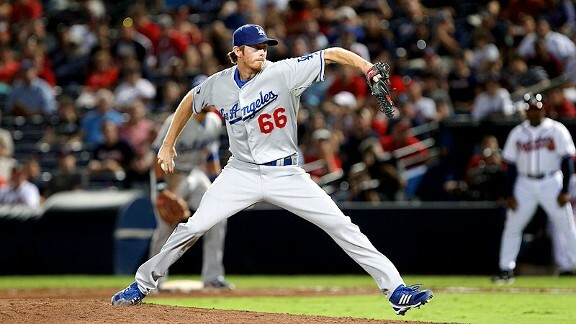 He has options remaining with the Dodgers, so if he does not hold down a roster spot, he’ll return to the Isotopes. Ramona Shelburne of ESPNLosAngeles hits on the conundrum of why it’s okay for the Dodgers to spend big on Matt Kemp but not Prince Fielder and has a theory: that Frank McCourt is using Matt Kemp’s lucrative eight-year contract as cover to keep the Dodger payroll low while selling the team. It all relates to that question we keep coming back to: Does committing big bucks to a major free agent enhance or reduce the value of a franchise? … Where this really gets interesting is when you listen closely to Kemp, Colletti and Stewart. Stewart said Friday that Kemp told him he wanted to get this deal done as soon as possible so the team could make a run at the top free agents on the market, most notably Kemp’s friend, Prince Fielder. Baseball’s winter meetings are Dec. 3-5 in Dallas. He also explained the Kemp agreed to take less in the first year of the deal to give the team more flexibility this winter. “The ballclub needed flexiblity, Ned was clear in explaining that,” Stewart said. “What was important really was the overall package for Matt. That all sounds wonderful until you listen again to Colletti, who said Friday that he “didn’t know if it was going to be possible” to re-sign pitcher Hiroki Kuroda, and noted earlier in the week that the team wasn’t likely to pursue free agents of Fielder’s class and price range. There’s no way Stewart and Kemp could have missed Colletti’s previous comments or been unaware of the Dodgers financial issues as they go through this sale process. Remember, Colletti and Kemp are close now. They’ve repaired their relationship and talk often. Colletti and Stewart go back 30 years. So you have to wonder whether something else is going on here.